The following is an excellent story about hunting kudu in South Africa submitted by JD African Safaris client, Todd R. After reading about his experience be sure to check out his awesome trophy photo included with this article! Since age 11, I have dreamed of hunting in Africa. My Grandfather would sit and read to me, “The American Hunter.” I had longed to travel to Africa. Fast forward 35 years of U.S.A hunting trips later, I had booked a hunt with JD (African) Safaris. JD had prepared every detail. I really felt prepared and supported for the unknown. We had arrived at Port Elizabeth, RSA. I would be spending a week hunting at Welgedacht with JD and Clint in the Eastern Cape of South Africa! A beautiful Friday morning in early May, I awakened after 24+hrs of travel to the sound of rutting Impala bucks. I can see them from the front porch of my cabin. After lunch and a rest, we are out for the evening hunt to try to track down the evening of great game animal viewing. After glassing over 4 harems of impala, we still do not see the bull impala from this morning. We move up the next valley. There my PH suddenly stops and motions me to join him with my rifle in front of the vehicle. The thickets are 6 to 10 feet high in 20 to 30 feet in diameter. I thought nothing was thicker than alders in Alaska; these thickets are worse. I could see nothing except the hind quarters of a Kudu pass on the trail up ahead. Clint whispers to follow closely as we maneuver around the thickets and unfortunately work straight into the sun. Clint advises me to not look into the setting sun. We have no choice as the wind is coming at us straight from the sun. I work in close and get to where we can see up the hill from the trail around this thicket. Clint has buried us into the edge of a thicket to breakup our silhouettes. He glasses for a minute and then asks me to be still and follow close instruction. I am to move in one fluid motion and get on the sticks put my head to the stock but don’t look up into the sun he says. I do as instructed and Clint leans over to say, I have your kudu at 2 o’clock, now look through your scope, I will talk you up to him. I look up through my scope and I am surprised to be able to see a curled horn above some acacia. My left eye is blinded by the sun, I trust my PH fully, he got on this perfectly. A few instructions later, I am on the target of choice just one bench from the top of the ridge. I can see a few other curls above the thickets. I can clearly see the target of choice is quartering away with his head turned back eyeing straight at us. Clint instructs me one more time, and then leaves with “take him”. At the shot, the hillside explodes with game. I see Kudu everywhere from 40 yards away to 400 yards distant across the top of the ridge. I watch my target as he is the lone kudu that turns 90 degrees and walks head down into the next thicket. Now, the work begins. Clint’s tracking dogs, and our great Trackers are now going to earn the prize from this hill side. Here I stood just moments before thinking there were only 3 kudu in this valley. Actually there were more than 30 on this hillside. When they were feeding no one could see them. The safari team and tracking dogs earn their keep this evening. As 30 minutes later, we are rewarded with an awesome South African sunset and a gorgeous Cape Kudu! What an awesome day, a dream come true. Amazing Thanks to JD (African) Safaris for putting such a memorable hunt together! This is only day 1. This experience all started by calling JD to ask, “How? When? and Where?” This is just what occurred on Day 1 of my 7-day safari! All the days were different and just as amazing as day 1. Ask JD, he can fill you in on the rest of the trip! 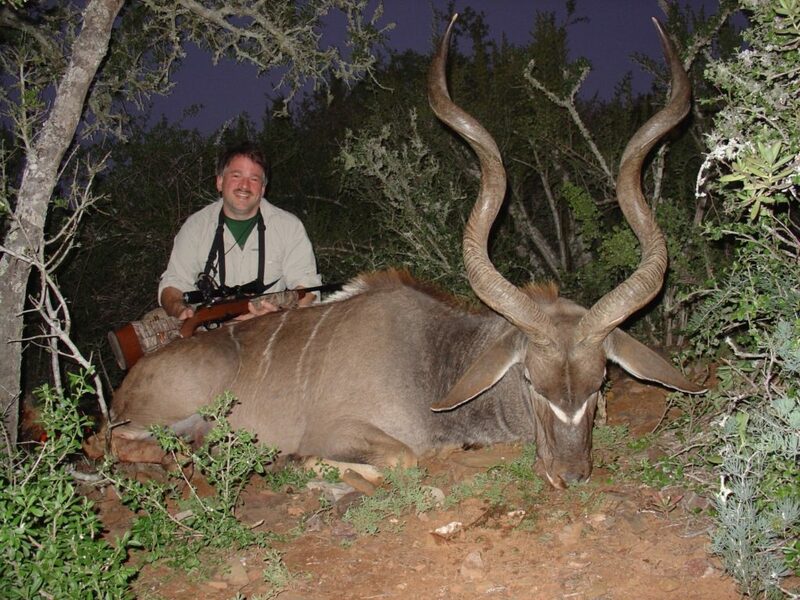 We’d like to thank Todd for submitting an excellent recount of a super experience hunting kudu in South Africa. It’s always fun to be a part of a first safari! If you’re ready to Step up your game and book your first safari, give us a call (we’re in the USA)! Or, shoot us a note on our form and let us know about the perfect hunt you’ve always dreamed of in Africa.